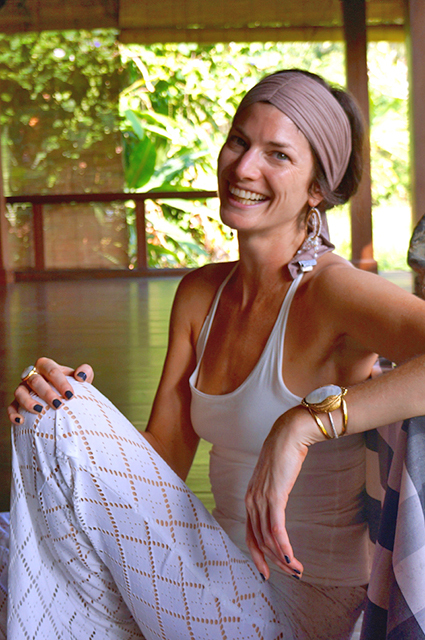 Alana’s mission is to guide people through a mindful exploration of how to intimately connect with the self and others for more effective relationships through Kundalini Yoga, spiritual psychology and sound vibration. She teaches the practice of self acceptance through tools of meditation and self-reflection. Alana became a meditation and Reiki practitioner at the early age of 13 influenced by her father’s “mid-life healing” and immersion into Buddhism and yoga. This precipitated a career as a Transformational Coach and bodyworker. She has spent her life studying the healing arts on a physical and energetic level. While attending Naropa University, where she became a licensed Transpersonal Psychotherapist, Kundalini Yoga became her main practice and love. Since, she has studied and trained in the tradition with master teachers such at Gurmuk, Harijiwan, Tej, Guru Das, and Guru Prem as a Level 1 and 2 teacher. She weaves the wisdom of the two into a dynamic and soulful class while amping the energy with the healing vibration of crystal sound and mantra. Encompassing all of her spiritual and healing work, Tantra Yoga was added to better work with relationships at a physiological and energetic level; Alana is a certified tantra educator from the Source School of Tantra. She is the creator of the “Transitions to Transformation” retreats and brings this work all over the world w/ her company Soul Voyage Retreats. Alana has been presenting at conscious festivals and events like Lightning In A Bottle, Burning Man and Apogea to inspire a younger generation to be spiritual activists. Alana’s Kundalini classes in Denver inspire people to explore and immerse in Kundalini!